Loved it. Adorable ornament. Quality. Received it quickly. Create treasured family memories as you hang this Reindeer Christmas Ornament on your tree this year. This Christmas Tree Ornament makes a wonderful Personalized Christmas Gift for your entire family. 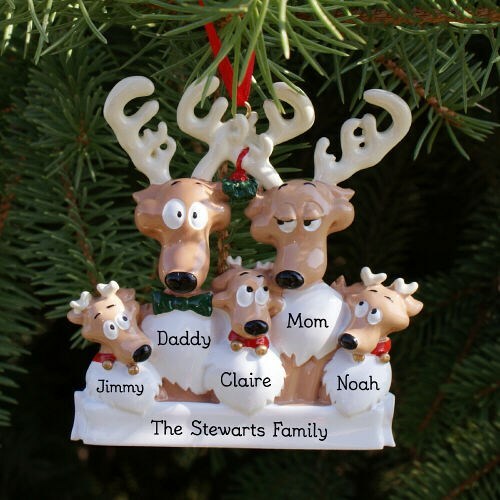 Our Custom Printed Reindeer Family Ornament is a resin Personalized Christmas Ornament and measures 3.5" x 4". Each Personalized Reindeer Ornament includes ribbon loop so you can easily hang it from your tree or ornament stand. Free personalization is included. Christmas Ornaments are personalized with any one line custom message; two parent's names and up to 5 children's names. Please note: Name: #1: should be the Daddy Reindeer and Name: #2: should be the Mommy Reindeer. Also, we can only accommodate a maximum of 8 characters per name. They loved it! I always get a family ornament each Christmas for my married daughter's family. This one was adorable! Additional Details Our Personalized Ornaments will make the perfect Christmas Gift.Be sure to view our entire collection of Christmas Gift Ideas.